Gather Greene is a newly opened event space in the majestic Catskill Mountains in Coxsackie, just south of Albany. 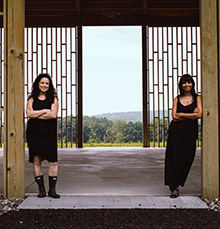 With the guidance of SBDC Advisor Sam Kandel, Jackie Brown and Amna Ali launched a business that will host weddings, special events and retreats at their nature-filled site with breathtaking views of the Hudson River Valley, Catskills and the distant Berkshires. It was an arduous and twisting path to raise the seven figure funds required to prepare the infrastructure and build, from the ground up, a huge 4,000 square foot pavilion complete with a full catering kitchen, six single-use bathrooms, two luxury dressing suites, a large upstairs lounge and an office for the owners. The pavilion can accommodate up to 250 seated guests. Guests can spend the night in one of 17 new personal-sized cabins. Each of the cabins comes with an outside deck, a king size bed, mini fridge, and coffee maker. Jackie and Amna are the embodiment of the entrepreneurial spirit and have been “all in” since the inception of the project in 2015. Their personal and financial commitment has been unyielding. Gather Greene is now taking reservations and began hosting events this fall. Upon completion of the project the partners commented, “…we simply would not be where we are today without Sam Kandel. When anyone asks us about our process, we always tell them to go get themselves an advisor at the SBDC - it was one of the smartest first decisions we could have made”.